The view of Boston took my breath away. “This is such a pretty city!” I thought to myself. The sky was a perfect, clear, June-blue. The Boston Harbor was to the left of me and the ocean and buildings farther on were sparkling, sunlight reflected in remarkable ways off water and glass. The Zakim bridge with its tall obelisk in the center was directly in front of me as I drove into the city. Boston is a small city and considered number 3 in the “Most walkable cities in the United States.” Millions of visitors come to Boston every year from all over the world. Despite the reputation for awful weather and sometimes rude and apathetic residents, Boston is beloved. When the 2013 Boston Marathon was bombed over a year ago, resulting in many injuries and three deaths, support poured in from all over the world. ‘Boston Strong’ t-shirts found their way to roadside kiosks in record time and the spirit of loyalty was strong in this city. Hosting world-renowned educational institutions, sports teams, a rich history and with that, many historical sites to visit,Boston is an amazing city. Only it has taken me awhile to realize it. The view I described above was from the Tobin Bridge leading the traveler into Boston. I was returning from an out-of-town work trip and it was with a small breath of surprise that I realized that I love this city. It’s taken a long time. When your heart is shaped by a place a world away, it’s hard to reshape it. The mold is broken and a new mold has to be created. But before your heart can be shaped in the new mold, it has to soften. And for a long time my heart was hard. I couldn’t love this city. Because if I did it meant that I no longer loved the places I had come from, the places that shaped me since birth. Or I didn’t love them enough. My loyalty would be suspect. If I admitted that this city and the city of Cambridge were entering my blood stream, were becoming a significant part of my story, and with that a part of my identity, my identity would face a crisis. I had crafted my “I”m not from here!” identity and spoke it loud and clear in a crisp, non New England accent. I feared that if I changed the narrative, then the places that shaped me would fade too far in the background, a mere memory in photo albums. What I forgot is that the human capacity to love, to loyalty is incredible. It is not being disloyal to love two places at once. It’s healthy to know you can use the amazing skill sets of adaptability and cultural competency to feel at ease in bargaining in a crowded bazaar full of color and spice and at ease hopping on a city subway and heading to a downtown store. If someone handed me tickets tomorrow that put me on my way to Istanbul or Cairo with an invitation to make my home there, I would be over the moon. But I would also miss many things about where I currently live, and who I love within that space. And that is a good thing. For as my heart has softened it has also expanded and includes not only people, places, and memories from miles away, but also those from the next town over, from down the block of my street. I now have recent history to look to and memories from 2 years ago instead of 10. And this recent history is as valuable as the past. It comes back to the gift of living between worlds, a gift made more precious as you realize the places you are privileged to live, invited to love. These are some of the themes I explore in the newly released book Between Worlds. 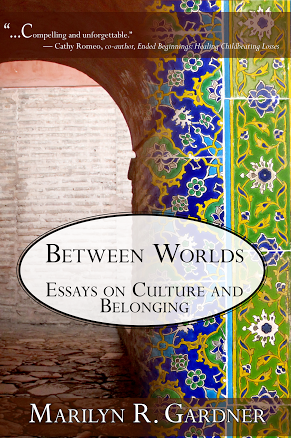 Between Worlds, Essays on Culture and Belonging is a set of essays on living between. The book is divided into 7 sections and each section is illustrated by my talented daughter – Annie Gardner. Home, Identity, Belonging, Airports, Grief & Loss, Culture Clash, and Goodbyes set the stage for the individual essays within each section. Those who read my blog will see some familiar themes and stories emerge, but they will be in book form, with new material, tweaked and edited to fit with the themes. And think about a book? It is so satisfying to have pages that you can underline and mark, highlight and turn down corners. Ah that feel of a book in your hand! Later this week I will be doing a book giveaway, for now order your copy and I will send you the accompanying discussion guide that offers questions you can answer either as an individual or within a group setting. The book happened because of you – because you read, commented, emailed, affirmed, and encouraged. 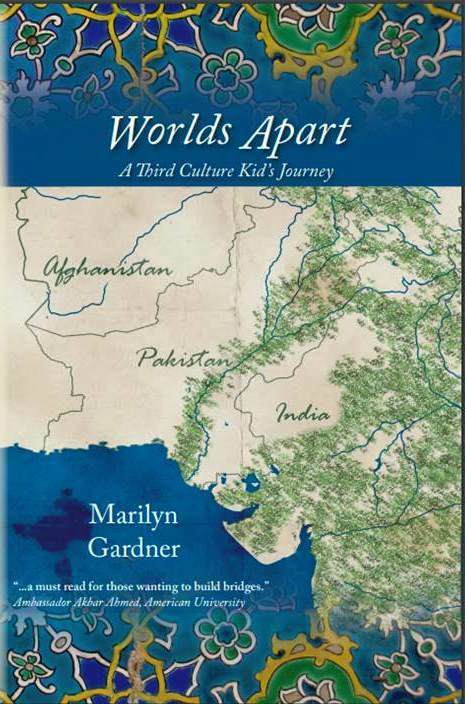 So thank you for your part in the book that is now Between Worlds, Essays on Culture and Belonging! So let me ask you this – how have you learned to love two places? Has it been a journey that has at times been marked by feelings of disloyalty or fear that if you learn to love the place you currently live you will lose a piece of your identity? Stacy brings us rhubarb muffins today! Being someone who loves rhubarb I was so glad to get this recipe. Head over to Stacy’s blog to see Fresh Rhubarb Muffins. The book is available on Amazon for pre-order and I would love to have you order it and hear your thoughts about living between worlds! As a TCK from Micronesia/Indonesia who is now at college in Chicago, I’ve been realizing recently that it’s okay to love Chicago as well as my other homes. I found myself replacing Boston with Chicago, and Istanbul or Cairo with Java or Papua as I read :) Thanks for putting these ideas down in writing, Marilyn! Chicago was the first place I came too after leaving Pakistan….I love this comment. And you are so, so far ahead of me. I’d love to hear how writing has helped you process this. I often wonder if I had started writing some of this down in college if I would have figured it all out sooner…..maybe, maybe I’m just a slow learner. I love that you came to Chicago too :) I would say writing, both blogging and journaling, has made the process of transition smoother. I started blogging three years ago while getting ready for a big move, and tend to write more whenever a transition comes up. Something about putting ideas down in writing makes them more concrete and easier to handle. Marilyn, this is beautiful! Definitely one of the core issues for TCKs, and I must admit I still struggle with this often. I have problems referring to myself as a German whenever I am in Germany, but once I am abroad I call myself German. I easily love cities, but I am not sure I would really say I am at home. It normally takes me a while. I had a similar experience when I came back to Tübingen (the city I study in) after 6 months in the states. It made me happy to be back and feel, this is where I belong for the moment. I am glad that loyality can be plural. Not all the time and not simultaneously, but in general. And that adding a new loyalty doesn’t mean letting go of an older treasure. Thanks for this powerful reminder! You said this soooo well: “adding a new loyalty doesn’t mean letting go of an older treasure.” beautiful! And I love that you had no conflicts cheering for Germany! Go Deutchland! I think because we moved a lot, I learned early to love more than one place at a time. I haven’t thought about it for years. Probably somewhere around 3rd grade, I realized it wasn’t disloyal to have new friends, that it didn’t mean I had forgotten the old ones from the last country we’d lived in. Pre-ordered your book the day it came out, and can’t wait to read it! I’ve often wanted to talk to you about this because I’ve felt you are ahead of me – learned it long before me. And I think you’re right – while my life held movement and back and forth – you experienced way more countries to love in your formative years. You have to either make the decision to love the countries and let them love you back or suffer immensely. I remember seeing something you posted on coming back from Thailand – on how it was good to be home. That’s what first got me thinking about the dual loyalty and how much I now love all these places. Thanks Jenni! I suffer from split loyalties, truly. It makes it hard sometimes to love and live in a country that has a habit of bombing other countries I love (yet, I do love my passport country). And I’ve kept up with the news as best I can with every country I’ve lived in and even a lot I’ve fell in love with just visiting. Beautiful thoughts Marilyn! I wrote about hearing the similar sentiments from a French Catholic priest here in Cambodia, when we’d only lived here a few months: http://trotters41.com/2012/07/01/ministry-lessons-from-a-french-catholic-priest-and-a-khmer-worship-service/ Basically he said we have to love where we came from if we expect to love where we’re going. Also I love how you note that we can use the cross cultural skills we’ve learned to adapt to new places. If we’ve adapted once, why wouldn’t we be able to adapt again? A really hopeful view for those returning from the field. And so glad you can now say you love Boston! Feels good to love where we live, even if we love other people and places too. . . Feeling that today as just this week I was saying how much I love my life here, then today, really missing my mom. About 8 years ago I heard a young pastor (with a lot of wisdom) say “If you hate the place where God has called you, you either need to repent – or move!” Powerful powerful words! I look forward to going to your post and reading more on this whole love and loyalty piece. And happy, happy Anniversary. “we have to love where we came from if we expect to love where we’re going.” This is something I want to remember. It is sometimes difficult loving where you are from, sometimes, not realizing it enables one to truly love then new place after the newness wears off and the thrill that comes with it wears off. I’ve just ordered myself the book! I don’t normally treat myself to hardback copies but I’ve so valued your posts and have learned so much about myself (A3CK) that I decided it was worth just going for it. I live in Manchester, England now, and never expected to consider it home. But it’s creeping into my soul and I’m getting used to it. For my children it is home and that in itself has been hard to reconcile. I’ve benefited immensely from my wandering childhood as well as sufferring at times as a result of it. It was a mixed blessing. And like many things it is also what we make of it. As I get older I see more of the blessing having been able to aknowledge and make peace with the pain. Juliet – I am so honored that you bought the book! I would love to send you the discussion guide – based on some of our interactions through comments I think you would appreciate some of the reflective questions. I feel so much like you describe here – benefited immensely but suffering at times….really well said. So contact me – communicatingblog@gmail.com and I will send the guide. Thank you for this post! It’s exactly what Josh and I were talking about 2 days ago! He had been talking to a new aquaintance (also an MK) who had just returned to Canada. The MK asked Josh how he had found it when he came back to Canada and Josh was sharing with him how he was slowly learning that it is OK to like Canada and to enjoy it – that it’s not turning your back on your “home” country. It’s not being disloyal. I’m so glad for this comment. I think one of the reasons I love reading some of Josh’s reflections is that he is so far ahead of where I was at his age! I wonder if writing has helped him in some of this – when we’re given the right tools we can process a bit better I think. Thanks so much for leaving this comment.